Leonardo da Vinci, Nikola Tesla, Marcus Aurelius, Albert Einstein, Benjamin Franklin, Bruce Lee and Richard Feynman all used journals. There is something about this simple technology. Nearly all notable humans throughout history and the present have kept some kind of notebook to dump their thoughts in. Every notable guest on the Tim Ferriss podcast lists journaling as a fundamental practice in their life. Physically writing in a notebook has never been a thing for me. I have always preferred typing. If I type a thing, I can always access it and port it into whatever medium I choose. The practicality of typing, combined with my nearly illegible handwriting pushed me away from pen and paper in the past. I finally decided to get into the practice of journaling about a year ago. At first I really had to settle into the moment to begin writing. I would clean the Scamp, make some coffee, stretch for a bit, meditate, and handle any other medial task I could before writing. Starting is the hardest part. Once I finally began, I allowed myself to write about anything. I made it as easy as possible for myself intentionally. By allowing myself the freedom to write about anything on my mind, I created the space to follow my inspiration. I was not bound to any one idea, thought, day or the like. Giving myself absolute freedom made it easier to pick up the pen and enjoy writing. Four months ago, I decided to dedicate myself to journalling every day. I picked up a small Moleskine from the store. I intentionally selected a small, lined journal. This way I could commit to filling a page every day without the task feeling daunting. Small journals are also handy because they are comfortable to keep in a pocket or backpack. Each day I wrote the date at the top of the journal and filled a page. I would write about the day, my thoughts, things I’m working on, ideas, books, videos, interactions, whatever I was thinking about. For a couple months when we were in Arizona, I woke up with the sun in the morning, stretched, meditated, then journaled. Stretching helps me settle into a meditative state. Once I had sat with my thoughts long enough to feel clear, I began journaling. If any thought or idea was occupying my mind, I wrote about it. Journaling has helped me feel more mentally clear than ever before. I think of idle thoughts like background processes on a computer. My mind keeps all of the background processes spun up to remember all the things. By writing the things down, I can terminate idle processes, freeing up mental bandwidth to focus on whatever my present intention is. Journaling helps me have more mind to dedicate to the task at hand. Having a daily journal to read back and reflect on also helps me to detect patterns and habits in my life. I can reread a few weeks of my life to get a feel for my mental space in the time. If I detect a pattern that coincides with inspiration I note it and work those patterns into my life. For example, I have noticed that I am most inspired when we rock climb often. On the other hand, I’ve found myself lacking inspiration when we fall into unhealthy eating patterns or spend too much time being sedentary. To put ideas into action, they must first be brought into reality. Journaling is the best way I’ve found to realize my thoughts. I keep two notebooks and a pen in my kit. I use the Field Notes primarily for ideation and drafting. The unlined pages are nice for drawing and writing in a freeform manner. Lots of lists, outlines and webs go in this little guy. I use a hardback Moleskine more like a traditional journal. This is where my daily entries are written. I also use this to bring thoughts together from my Field Notes. There are probably better notebooks out there, some note taking geeks may scoff at the idea of using a Moleskine over their favorite Japanese paper manufacturer. But, the fact is that we are traveling all the time. I can stop into any Staples like place and find this journaling kit. I'm currently on my second Moleskine and Field Notes pair. Interestingly, I use them up at a similar rate. For the pen, I'm currently using a uni-ball Deluxe Micro. It's a great, cheap, simple pen. I think it feels nice to write with on this notebook pairing. The flat clip fits perfectly into the binding of the Moleskine, and the Field Notes straps in cleanly with the elastic. And don't forget the finishing touch, a custom sticker by Elsa Rhae. 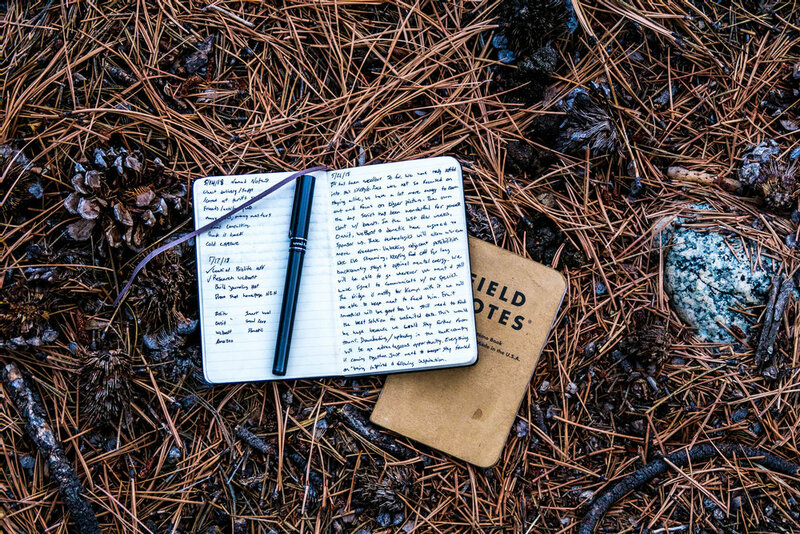 Hopefully this inspires you to start keeping a journal or notebook of some kind. Let me know your thoughts and experience with journaling in the comments.